Giving this book a 5* review based purely on the fact that it made me cry and books don't make me cry very often! As well as making me cry this book was so wonderfully written that it made me laugh and feel a whirlwind of emotions all at once. I honestly felt I was living this book as I was reading. 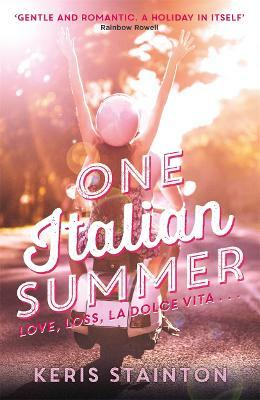 One Italian Summer is an amazing YA that features loss, friendship, romance, drama and I only wish this book was longer - I loved it so much. The main characters are a trio of sisters I only wished I had; they're portrayed as best friends, believing they tell each other everything and supporting one another in a way only sisters can. The book is based in Italy, a place very dear to their hearts and they go away for what feels like could be their last summer as a complete family - before the sisters go their separate pathways in life. But they go in honour of their late father, as Italy is a place where they find parts of his soul/life everywhere they go. As they story plays out their is a love that unfolds that I'm sure we can all relate to, a "I want him, but does he want me too?" kind of tale; that makes you both happy and scream wishing that you could make the characters do as you want them to! Along side this, there is another romance. A secret romance. One that leads to drama and big decisions; one that is played out in the background of the book but soon becomes a major part of the story line. Although the book feels like it is set around typical teenage romance, the love feels pure and something much older than a first love. It is written so purely and portrayed in different ways - something for everyone to relate to and that's maybe why I like this book so much. But mostly, this book is about loss and letting go - how do you carry on when such a big part of you, your life and your soul has gone? How do you keep your family together when the foundations have cracked and the main component is no longer there to support? This book is heart breaking and relate-able. Touching. I honestly felt connected with the characters in a way you don't always get when reading a book. A wonderful summer read that covers so many important topics throughout. I wish everyone would read this book! This book was great. I loved the setting of Italy, it was really well described and it really made me want to see the city. There seemed to be a lot of knowledge behind the descriptions too which was lovely to see. I really enjoyed the voice it was told in, Milly was a great character to hear from. All of the characters are great, especially Milly's sisters, who had some of the best lines in the book, especially early on when they first arrive in Italy. Luke is also a great character and I was routing for Milly and Luke from the beginning. Rainbow Rowell called this book 'gentle and romantic' and I would definitely agree with that. It's a perfect summer read and one that would be a great choice to take on holiday and read by the pool or whilst laying on a beach. It's just a lovely book and I will definitely be recommending it to others and I'm so glad that Readers First very kindly sent me a paper copy, so thank you again for that. One Italian Summer is summertime wrapped up into a lovely heartfelt novel, the perfect thing to be reading poolside or on a plane. If you are looking for a swoonfest with some real heart tugging moments, then I can't recommend One Italian Summer enough. Milly and her family are travelling to their regular summer destination of Rome for the first time without their father, returning to his favourite place to spread his ashes. Her family feels disconnected without him, with their mother working all hours available maybe this holiday will allow them to focus on each other? Rome brings with it family parties, the best food and beautiful Luke, who Milly has always loved from afar. Determined not to let love get the best of her, Milly works to make this summer in Rome a true memory of her father. I really liked this lovely story. I especially love Milly's sisters Elyse and Leonie, their personalities leaping off the page. Milly is funny and sweet, trying to keep her head afloat and her eyes off Luke. There is a point where they return to the hotel their father used to work for which absolutely broke my heart. Somehow this book weighs the lightness and the grief well, never feeling too heavy and painful. This is a great summertime novel about celebrating your family, whether they are with you or gone. What to read next: When Dimple Met Rishi by Sandhya Menon The Upside of Unrequited by Becki Albertalli Queens of Geek by Jen Wilde Thank you to Hot Key Books for sharing this copy with me.